At first glance, Amanda Earl's Kiki appears to be a straightforward homage to the creative hub that was Montparnasse between the two world wars. But the poems within this book go far deeper than setting smoke-filled scenes, where Dadaists sip red wine and tap ash from non-filtered Gauloises while pontificating about their work and its muse. Earl's first full collection is as much an amalgam of tributes as it is a collection of poems. As the title suggests, Kiki, otherwise known as Alice Ernestine Prim, is the central figure, but this book has far too many layers to only be concerned with tipping its hat to the iconic muse, actor, artist, singer, writer and model that was the ‘Queen of Montparnasse’. Anyone can and many have cut up texts and stuck them back together in a worthlessly random fashion. Rehashing old words into a half-coherent order isn't anything particularly spectacular in itself. Whoever started this strange way of creating new context from old words is beside the point; what matters in this case is whether Earl's tribute breathes any new life into this literary tradition. Poetry is arguably the most subjective of all the art forms and its potential beauty will largely depend on its reader’s perspective. After all, it is in the magic that happens between the page and its interpreter that brings a poem to life. Having said that, there are obvious goals any forward-thinking poet should strive for: accessibility, relevance, individuality, a good sense of rhythm, honesty and so forth. By taking on the task of writing poetry about a time and place she can only know through research and study, Amanda has set herself a much more complicated goal. And it is a task she has clearly not taken lightly. Right from the start, a strong sense of imagery is established which the author builds upon throughout. This building process is key to the overall effect of the book. One line feeds off the other and brings the work to life as one collective piece. I am quick silvered glass, made of mercury. I can throw you off balance in the swing of a mood. The imagery is perhaps at its strongest in the third and shortest poem, “Opium”. Rather than the obvious sensationalism we are all used to when it comes to writing about narcotics, Amanda uses a wholly restrained subtlety to ruminate on the numbing effects of opiate use. This is opium heated on steel. This is a lamp filled with perfumed oil. This is a pipe covered with ivory and mother of pearl. I am the rhythm of flowers, the speed of metal. I am a slow rising balloon. Using a combination of cut up texts and snapshots from her imagination, Earl places repetitions throughout the book which have an echoing effect as they chase each other from page to page, eventually overlapping into a surreal collage. Getting lost in this book is like falling into a cave where a dozen choirs are singing rounds, and rather than trying to decipher the words you simply soak up the sounds. Along with the aforementioned repetitions there are a plethora of reflections, some clear and obvious while others are more like shards of light bouncing off unsettled water. It is these poetic inflections that lift this collection above other similar works that simply list dates, events and names of participants. 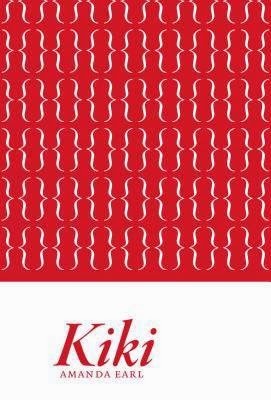 Amanda has the good sense to leave matters of fact to the historians; consequentially, Kiki is a book of poems inspired by historical events, yet not mastered by them. The fourth poem is a cut up from Naked Lunchpresented as a conversation between Kiki and Burroughs. It is in this final poem that Earl's penchant for iniquitous word play really comes into fruition. While every page can be appreciated as a standalone poem, the four sections each containing one poem apiece work best as a whole. Amanda presents snippets that suggest more than they state without ever straying into that grey area of obscurity where the point is lost and nothing makes sense. These poems burrowed into my subconscious and conjured up all kinds of unexpected reactions from my imagination. Isn't that what art is for? To inspire emotion and provoke reaction?